This delicious and luscious Vietnamese Frittata features eggs, ground pork, onion, and basil. The minute it comes out of the oven, you will marvel at how good it smells. I can say with confidence that almost every family in Vietnam eats frittata once a week. 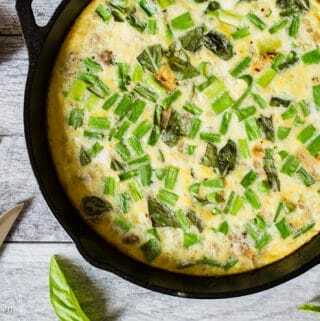 Traditional Vietnamese Frittata usually contains eggs, ground pork, and aromatics such as shallots, scallions, and chives. We beat the eggs, then add all other ingredients and mix well. After that, we pour the egg mixture into a pan, cook until the bottom is golden brown and then flip it, cook the other side until golden brown and the meat inside is fully cooked. It only takes 5-10 minutes to cook at medium-high heat depending on the thickness of the frittata and how much meat is in the dish. What I’m introducing to you today is a modern version of Vietnamese Frittata with my own twist. I absolutely love the traditional version, and it was always one of my most favorite dishes as a kid. However, I find that the traditional method yields a frittata with a somewhat dry and dense texture. Adding liquid, either water or milk, improves the texture a little but I wasn’t totally satisfied. 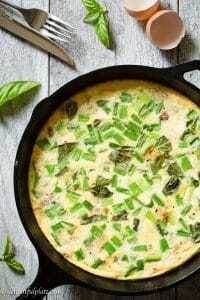 Besides, flipping the traditional frittata can be tricky, especially if there are a lot of add-ins. The question “how to improve and elevate it” keeps lingering in my head. I recently watched a Japanese cooking animation (anime). One of the characters in the animation is from a family that owns an Italian restaurant. He made a salad dish containing frittata during one exam at his cooking school. I know this may sound silly, but I had a light bulb moment when I watched it. 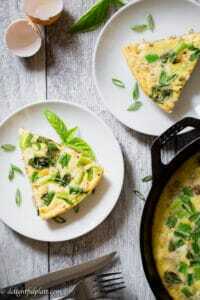 The cooking method of Italian frittata could be the answer to my question! I read this useful article “How to Make a Perfect Frittata” on bonappetit.com and tested out the new method. First, I sauté onion and ground pork in my cast iron skillet to cook off the moisture as well as render the pork fat. After beating the eggs, I add chopped scallion and basil, mix to combine and then pour the mixture into the skillet. When the edge of the frittata starts to set, I put the skillet into the oven at 400F and cook for 12-15 minutes, until the center sets. I am so happy to report that this method results in the most delicious Vietnamese frittata I have ever eaten. Though I have made this modern version for dinner multiple times now, I’m still amazed at the soft and luscious texture of the frittata. Just a small twist can make a huge difference! Another thing I like about this method is since it takes longer to cook than the traditional method, the flavors from all the ingredients meld together much better. You should fully cook the onion and ground pork to release excess moisture before adding the eggs. You will also render fat from the pork when doing this. I always transfer the cooked pork and onion mixture to a plate lined with paper towel and remove excess fat from the cooking pan. to cook this dish. Detailed instructions are in the recipe card below. 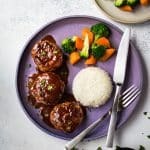 Another tasty recipe that may help you use up eggs and ground pork in the refrigerator is this Egg Meatloaf (Cha Trung). 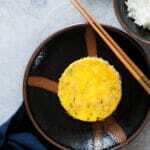 This Vietnamese Frittata features eggs, ground pork, onion and basil. 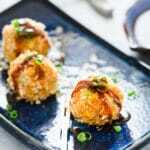 It is so luscious, tasty and easy to make. Prep all the veggies and herbs: dice the onion, chop the shallot, cut scallion into 1'' long pieces and roughly chop basil. Beat 8 eggs in a bowl, add almond milk, scallion, basil, 1/8 teaspoon of salt, 1.5 teaspoon of fish sauce and black pepper. Mix to combine. Set aside. Place a 9'' - 10'' cast iron skillet over medium high heat. Add olive oil, shallot and onion, sauteed for about 2 minutes until fragrant. Add ground pork to the skillet, break into small pieces. Add 2 teaspoons of fish sauce, 1/4 teaspoon of salt and black pepper. Cook and stir frequently for 4-5 minutes to render fat and cook off moisture. Line a clean plate with paper towel and transfer the cooked pork and onion to the plate to absorb excess oil. If there is too much fat in the skillet, remove some of it. You need just enough oil/fat in the skillet to coat the bottom and all sides of the skillet. Adjust the heat to medium. Add the pork and onion back to the skillet, spread into a thin and even layer. Pour the egg mixture into the skillet. Cook until the side of the frittata starts to set, remove the skillet from the stove and put it in the oven. Cook the frittata in the oven for 12-15 minutes, depending on the thickness, until the center has just set. Remove from the oven, let it rest for 2-3 minutes, then cut into wedges and serve. Hi, Marvellina! Thank you so much for your kind words! I’m still finding ways to improve my photography skills. Your photos are stunning and whenever I see them on Pinterest, I always think they look so beautiful with a unique style. Thanks so much for commenting, Trang! I didn’t spend time in the kitchen with my mom at all when I was still living with my parents haha. I only started learning to cook after living far from them. 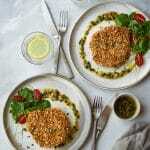 You can try Vietnamese recipes on my blog and I can try your baking recipes 😊. Made this tonight and it was delicious! The only things I did different was that I added 1/4 tsp of Chinese 5 spice powder for a little extra flavor. I WILL make this again. Hi, Alisha! Thank you so much for trying my frittata recipe! I also like the aroma of five-spice powder a lot, and I’m sure it makes the dish even more delicious. I will try adding it next time I make this dish. Thanks again!